January 14, 2013 April 10, 2019 by Tara R.
I grew up in East Tennessee in the heart of Appalachia under the shadow of the Great Smoky Mountains. Being a true Southern girl, food was an important part of my upbringing. Each summer my mother’s people would gather from far and wide for a family reunion, always held at my great-grandfather’s farm. The uncles would haul in two flatbed hay wagons and each one would be loaded down with homemade Southern food. One wagon held the fried chicken, roast beef, green beans and ham hocks, melt-in-your-mouth biscuits, smashed taters and gravy, homemade jams and jellies (for the warm biscuits), and every other comfort food imaginable. The other wagon was reserved for desserts. Coconut cream cake, chocolate cake, apple pie, cherry pie, peach pie, pecan pie, cobblers and cookies. Enough sweets to throw a third world country into insulin shock. To the side of the wagons were the grills cooking up hot dogs and hand-patted hamburgers ~ made from farm raised beef. Under the huge antebellum oaks sat the ice cream churns. All the kids clamored over who got to sit on top while the grown-ups cranked. The one holding down the crank got first dibs on the ice cream when it was done. And, it wasn’t just these once a year blow-outs. Food was not looked upon as a bad thing back in the day. You celebrated food. You never worried about carb counts or fat (using lard added flavor! ), and forget about combining two, three, sometimes four starches in one meal ~ it was a given. I have my mother and grandmother to thank for my love of cooking. These women could put on a spread like it was your last meal, any day, every day. It’s called comfort food for a reason. Breakfasts were glorious. Biscuits, fresh butter and homemade peach jelly, farm raised ham or sausage, fried potatoes and eggs still warm from the hens, tomatoes fresh from the garden, and whole milk thick enough to leave a white mustache. But, my favorite was egg gravy. For the uninitiated that is warm pudding served over toast. I do use wheat bread these days, but the idea is the same. 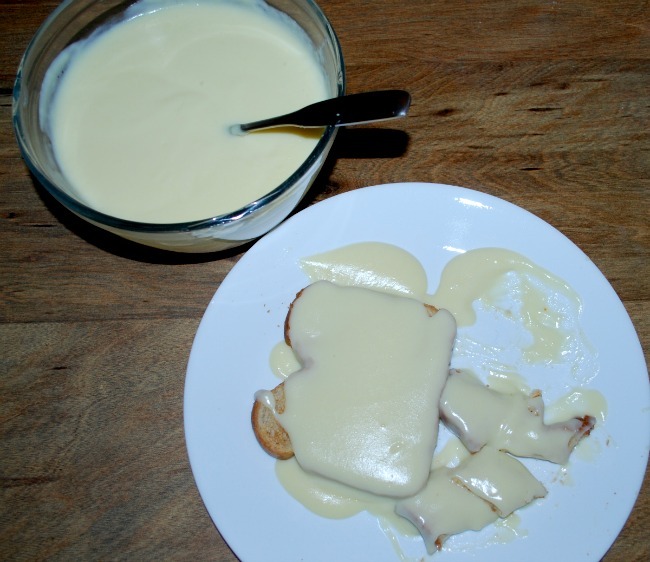 Warm, buttery, vanilla pudding poured over crispy slices of bread ~ preferably homemade. I know, it sounds truly odd, but homemade pudding is fabulous. The combination of the rich, sweet pudding and the crunching bread is delicious. And it has to be homemade pudding, none of these powdered mixes or chemical infused plastic cups. I make my pudding the way my grandmother and my mother before me did, in a pan, on the stove from a recipe handed down through the generations. Oh, to be young again and be able to eat whatever I want and not gain an ounce. Only, I would also have to leave the house at first light and not stop moving, running, playing, hiking, biking, an all around whirlwind of activity, until dark. There has to be a compromise in there somewhere. Combine sugar, flour and salt. (Mixing until well blended ~ this helps prevent lumping). Stir in milk, and heat over medium heat until mixture begins to thicken ~ 10-12 minutes ~ stirring constantly and scraping the bottom of the pan to prevent scorching. Beat egg yolks until thick and lemon colored. Gradually stir in about 1/4 cup of the hot milk mixture into the yolks (this tempers the yolks keeping them from curdling when adding to the pot), add egg mixture to the milk mixture; continue to cook, stirring until mixture thickens ~ 2-5 minutes. Remove from heat and stir in butter and vanilla. Ladle hot pudding over toast and serve. Spoon any remaining pudding into a bowl. Cover with plastic wrap, laying it directly on the pudding to prevent a ‘skin’ from forming over the top. Chill and serve. Mmmmm… I love to throw caution to the wind now and then and just make and eat food that tastes good and makes me happy. This sounds delicious and I know my kids would love it! What a great post. Anxious to try it. Thanks Tara. What a great memory. Egg gravy sounded delicious while I was reading, then you posted the recipe. We share a pudding recipe. My mom passed this one on to me a few years ago and I will never make pudding from a box again. The homemade stuff is so much better! I loved every word and the images you conjured up. I’m a southern gal too and this made me smile. Gatherings really are about family, fun and food. Love that recipe, never tried it before. Will have to do so! Tara, this sounds amazing. I will be making it this weekend. This story reminded me of my great grandma. She used to make buscuits that would melt in your mouth. She would mix Butter and sorghum syrup together and we would dip our biscuits in. What a terrific story! Im so glad you shared with us. YOU WROTE IT. I am sitting here, all teary eyed and smiling because it sounds just like I knew you would. I could smell the fried chicken and now I just might make pudding on the stove (GOD, what have you done to me!?) because I want to try this, want to smell the sweet scent rise in my own kitchen and watch Gio or Jacob’s eyes light up with joy as they eat it. like I said on facebook, this story would be a perfect addition to Listen to your Mother. Want to come to NYC to audition?